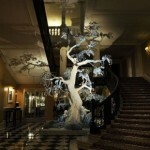 John Galliano, creative director of Christian Dior, has designed a Christmas tree for the renowned London hotel Claridge. 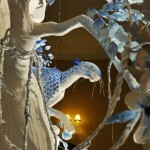 The tree stands 20 ft high and is made up of paper-mache, paper and polystyrene. 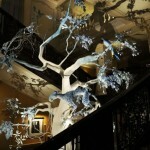 Its inspiration from icy snow scenes, mixed with a tropical twist, dominates the hotel’s lobby. 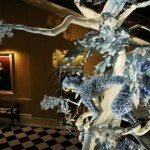 The tree is painted in white and metallic blue and settled on the branches are a handmade leopard, several parrots and a dragonfly. 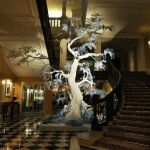 This partnership marks the first time in the hotel’s 112-year history that Claridge’s has worked with a famed fashion designer on its Christmas tree. 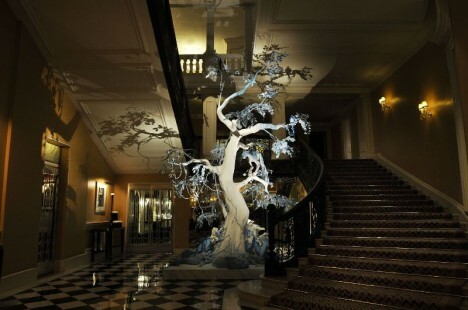 Claridge’s Christmas Tree was revealed on December 1st at a cocktail reception, which also featured a display of 20 vintage gowns from the Christian Dior archive, hand-picked by Galliano. The tree will remain up for display in the hotel’s lobby until January 6th.